A new year holds fresh promise; it’s a chance to mentally reboot and focus on what you want to achieve for the coming months by planning new goals. And I love a good budget goal! This year I have so many goals that I’ve had to split them into categories; I have health goals, personal goals, professional goals and obviously, financial goals. In this post, I’ll run through my financial goals for the year, which might give you some inspiration or motivation for yours. But before I do, I’ll tell you about a few of my 2018 financial goals. At the start of 2018, I was halfway through my goal of paying off £16k of debt in one year. In July 2018, we smashed our goal and joined the debt free club, which was the best moment of my year! Our debt story was a familiar tale for many UK households; a new car on finance, a home renovation loan, constantly spending every penny we earned by payday and digging a hole for ourselves. To reverse our fortune was a dream come true. In addition to paying off debt, I created new financial habits in 2018 including learning to budget effectively, saving, creating sinking funds, and not living beyond our means. Between paying off our debt and cutting our overspending on groceries and bills, the drop in expenditure has enabled me to cut my working hours significantly to allow me to focus on building my blog and other side hustles. So to anyone out there dreaming of working less- it is possible, and it all comes down to what you spend! Finally, I’m really pleased that my budget planner is now available for sale on Etsy. This is the planner we used when paying off our debt and it collates all of your financial information very simply and concisely. When we started our debt pay off, the only budget templates I could find were in USD so I created this due to the lack of UK budget planners out there! So if you don’t already have an electronic budget planner, this is a great one to aid your financial goals in 2019. With this budget, you’ll be taking those first steps towards debt freedom! So, on to 2019! I’m really excited to build on last year’s progress and really create the life I want. Here are my financial goals. 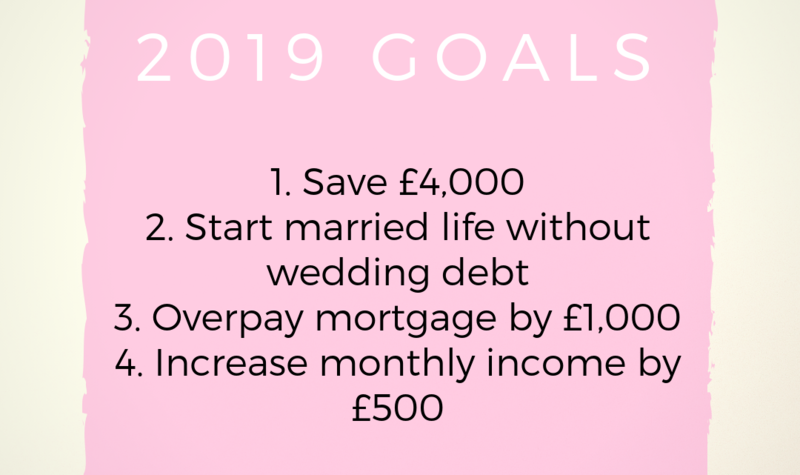 During our debt pay off, we wanted to save about £5-10k as an emergency fund afterwards, but our expenses have dropped significantly since then and I know that £4k would be a decent figure to start with, so this is my aim! I think that once we have this saved, we might aim for a higher figure but we will decide when we get there. At this point, no debt and £4k in savings seems like a dream. So I’ll be relying on my budget planner to figure out how much we can save each month, and then it’s down to willpower! We are getting married in April and I really want to do it without debt, so our wedding needs to be fully paid for in advance! My partner and I have been together for a long time and we had previously booked- and cancelled- our wedding. The thought of a big day doesn’t appeal to us- I can see why it would for others, having everyone you love together to celebrate a special moment, I get it. But I know myself; I would feel overwhelmed, I wouldn’t sleep in the run up, I’d feel pressure to make everyone happy and lose myself in the process. It doesn’t feel worth it to me. So back in September, we finally decided to book a week in New York and tie the knot at city hall- just us two. The truth is, I’m not a big believer in marriage anyway so our plans feel commensurate to the significance of getting married for me. And I’m really looking forward to the excuse of having a big blow out trip, and coming home and getting settled into married life, which I imagine will be exactly the same as life before, with a few good memories to look back on! As for the financial element, we estimated the cost to be about £4k, and some family members have kindly gifted us cash as a wedding gift which will go towards covering the cost, and we will save for the rest. But I’m sure I’ll cover the topic of planning a New York wedding on a shoestring in a few blogs closer to the big day (or small day, as I hope it to be)! The maximum we are permitted to overpay under contract, but this will still knock a massive £30k in interest, and 7 years 9 months off the term of our mortgage. With a mixture of side hustles and plans for 2019. I have an exciting announcement for the coming weeks, so watch this space. But as with last year, I’d love to be my own boss and work on projects that are fulfilling while helping others get out of debt, change their financial habits or just sleep a bit better at night without money worries plaguing them. So just wait and see what I have in store for 2019! So, these are my financial goals for 2019. Comment below and tell me yours. 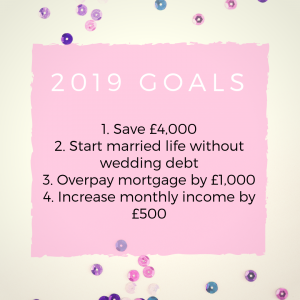 Are you hoping to get on top of your debt this year, build savings, increase your income, cut your expenses, or just check your internet banking without feeling a panic attack coming along? I’d love to know so please do share below.